But today I've found some lovely, lovely musical things that I just have to share with so many people as possible. First, this. It will be the best 2 minutes 26 seconds you'll spend on the net today. I guarantee it! "You stole four minutes of my life and I want them back! ...Oh, I'd only waste them anyway." Edited to add: Thanks, NBC Universal, for taking the video down. It was really violating your rights to the material, what with all that promoting the musical free-of-charge and getting the hype about the movie up. You did the right thing removing it. However, the video might still be available at Gilbert's blog, check it out. As everybody keeps saying in the comments: this needs to get done. I think animation is the right medium to do Wicked The Movie. With live-action all the flying around and monkeys and whatnot is very likely going to look cheesy - it's not 1939 anymore... But with animation - hand-drawn or CGI, doesn't really matter to me - it will look perfect. So many things that look great onstage but would look plain silly in live action could maintain the awesomeness in animation. Besides, there has never been an animated adaptation of a stage musical before, it'd be very unique! And Defying Gravity just has to look like depicted above. It's perfection and deserves every praising comment it gets. 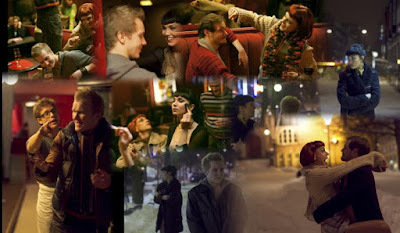 The first glimpse of the upcoming Finnish production of RENT. Or actually, I love it already. For two things: one is that they're gone outside to take these awesome pictures in costume. It shows some dedication! The second is their website. For once, is one Finnish theatre company who knows how to handle the internet. The site can be found here, and is it nice already! Pictures, info on the actors, very well organised and looking good! It's a small, new company, but if the quality of their web page is anything to judge by, they've the energy and commitment to do some great musical theatre too! You see, the websites of Finnish theatres are not that great on average. Let's compare this to Helsinki City Theatre for example. But the problem is that the whole place is a huge mess. Moving around the site to find what you want to see can be a big pain. You won't find the actor's face even accidentally if you just keep surfing the HKT site - you have to get there through Google. Info about the play introductions they hold before every premiere can maybe be found if you dig around the site with a shovel, but even then it requires good luck. And even though there is a huge pile of pictures of nearly all their plays from the last ten years you can't see them: you can't get password to them unless you're a journalist (but then again, those with sharp eyes will find this super-secret password floating on their site too, so no panic). And then there's RENT by Suomen Musiikkiteatteri Ensemble ry. A little group that has just been founded. All the info on their site is in logical order, us un-journalist people can see and copy the pictures too, there will be videos in the future, share buttons to every website imaginable are readily available... This is what every big theatre in this country should look up to. This is how it's done today. Well, there's something I'd still like to see: some sort of send feedback page. But since the premiere's still two months away, they'll have lots of time to put it in! And of course I'm very much looking forwards the actual show too! It's again the time the two readers of this blog have been awaiting, Les Mis Album Comparison time! And what's a better Les Mis song than One Day More? Let me tell you, nothing. It's all downhill from here. So, today, let's define the best showstopper! A calm beginning with that little fairy dust sound - hopefully you know what I mean... And everything sounds good, I especially like Frances Ruffelle's Eponine. When Enjolras's part kicks in the orchestration gets appropriately big, goodbye to the light sounds of the beginning! The counterpoint sounds good, but it leaves me feeling it could be even better. On the whole, as it often is with this album, a good, basic, here's-what-this-song-sounds-like version of the song, even though it doesn't really rise above that. Very lush, peaceful beginning. Not so sure if I like this Valjean though - thanks, Danish CD, for skipping all the big Valjean songs so I haven't had the change to compare them yet. Cosette and Marius sound like they're a little squished in the background, and the orchestra doesn't sound quite as natural as in the previous one. Interesting-sounding Eponine! I don't like this Enjolras, though. The orchestra gets gradually bigger all the time, huge choir! The strings on Javert's and Thénardiers' parts sound great, as does the choir part. This has bigger energy than the previous one. Cosette is mixed way too loud in the counterpoint, though, and the final choir doesn't sound quite as good as it could. A little disorganized. More fairy dust sounds! A lot of Valjean vibrato! Oh yay. Oh, it's my favourite vibrato Javert. What's up with these guys? I know some love this CD to bits, but I really don't care for that Javert... The chorus parts on this track sound very good though, big and pretty powerful. À la volonté du peuple! The counterpoint sounds a little messier than usually, if that makes any sense. Not bad ending, though! A different beginning, more focus on the bell-like sounds and less on the strings. Nice wall of sound. The orchestra sounds more like a real orchestra here, if that sentence again makes any sense. Doesn't stop it trying to drown the chorus, though, but it sounds very nice. I love this Thénardier. He sounds like a mean troll. Very big ending. One of the brighter moments of this CD! 3 points - besides Master of the House, your best yet, Danish CD. Congrats. But everything is sooo good here. The dream cast. The huge orchestra. This is One Day More at its best! So calm in the beginning and then getting big with Enjolras and the choir. Just wow. And I just love Philip Quast. This is awesomesauce. I've a feeling I know who is getting the seven points... I actually just got little shivers running down my spine at the final "one day more!" of the track! Nog één dag. This is another one I've looped big time - I almost can sing along this despite not knowing Dutch at all... And this is very near perfection too. I especially like this Marius, he sounds so young and just simply Marius-ish. The mixing is perfect, you hear everybody well, which is not always true on every of these CDs. And oh hey, it's my favourite Enjolras again! The choirs, great. The orchestra, great. I don't know... The fight for seven points will be tighter than I expected, since I had almost forgot how good version this is. The final chorus is the best yet. ...because I was absolutely swept away by this. Better than I remembered, and that's a lot! 7 points. The beginning is simpler with just one violin, and I like it. I also like John Owen-Jones. This Marius sounds very Marius-ish to me too - I really like Michael Ball, but he still isn't my mental voice for Marius, it's someone with a little more, hmm, maybe vulnerability, if you will. I think this must be my second favourite Enjolras after the Dutch guy. And hey, Earl Carpenter! And great big drums in the background! Wouldn't you know, I really like this version too - maybe not as much as the previous two, but this really gets big and epic-sounding too. And for the first time you clearly hear how Javert joins Valjean in the "tomorrow is the judgement day" line! We'll see if the situation changes in the battle of Eponines next time!